Welcome to Tizen wearable Web application development! Create a wearable Web project using the Tizen Studio. The following example shows you how to create and configure a basic wearable Web application project in the Tizen Studio. An application project contains all the files that make up an application. On the left, the figure shows the application screen when the application starts. The screen displays the Basic text. On the right, the figure shows the application screen after you tap the text. The screen now displays the Sample text. Tapping the text area switches between the 2 texts. You can run the Web application on the emulator or a real target device. In the Device Manager, click the Remote Device Manager button. In the Remote Device Manager window, click +. In the Add Device window, enter the device and network details (use the IP address you noted before), and click Add. In the Remote Device Manager window, switch the new device on by clicking the switch under Connect. The device asks for user confirmation. 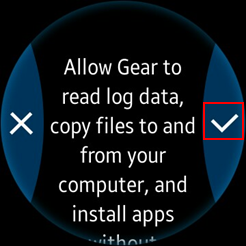 To allow Gear to read log data, copy files to and from your computer, and install the application manually, click the accept mark. The wearable application created with the Basic UI template has a simple user interface with a text component showing the Basic text in the middle of the screen. The UI is created using W3C/HTML. The W3C specifications provide HTML and CSS features for creating a user interface. With HTML, you can define the structure of the application screens, while CSS allows you to define the look and feel of the screens. <title>: Defines the title of the document. TAU (Tizen Advanced UI) is a Web UI library that enables you to create and manage various kinds of UI components. The components represent a visual UI element, such as a button, checkbox, or list view. You can manipulate and interact with the application screens through the UI components. For more information, see Tizen Advanced UI and Tizen Advanced UI framework Reference. TAU helps you to create Tizen Web applications easily. The following figure shows the role of TAU and its relation to the Web application. The UI in the Basic UI template only contains one visible text component. To create a more elaborate UI with more components, screens, and functionality, use the TAU library in your application. The following example shows how to create a list on a page (screen), create a second page, and move between the pages. The Tizen Studio comes with the Package Manager tool, which you can use to install the TAU packages required for TAU application development. Make sure that you have the TAU (IDE) package installed to enable you to create the Web application using a TAU template. Create a project that uses the TAU library. Go to File > New > Tizen Project. Select Template > Wearable v4.0 > Web Application > TAU Basic. In the Project Explorer view, view the project. The TAU library is located in the lib folder. You can create a new project using a TAU template or a TAU sample application included in the Tizen Studio, as shown above, or you can add the required TAU libraries to any existing Web project. This element is also mandatory. This element is optional, but mandatory if you want to develop a Web application on a circular device. This element is optional. If you import this file, you can easily get a list view that handles rotary events. You can add additional <script src="<CUSTOM_LIBRARY_OR_JS_FILE>"> or <link rel="stylesheet" src="<CUSTOM_CSS>"> elements to include your own scripts and style sheets. However, place them after the default <script> elements, so that you can use any TAU APIs provided by the default libraries. Open the index.html file. By default, the <body> element of the HTML file contains 1 page (<div> element with the ui-page class) that contains a header and a text paragraph. The above style addition modifies the screen to show the content area text with the turquoise color. Add a list for the first page. For a more advanced option on a circular device, you can also create a snap list view, which is a circular-specialized list view component. With the SnapListview, you can scroll the list with the bezel. In the Tizen Studio, create a new HTML file and name it second.html. Create navigation between the pages. Run the application in the emulator, and click the Go to Second Page link to move from the index.html page to the second.html page. To navigate from the second page back to the first, use the Back key. Enter the file name as app.js and click Finish. You can make your application exit by adding more lines to the app.js file. You have to consider the fact that when the user clicks the Back key, the application can only exit if it is showing the first page. If the second page is showing, the application must return to the first page. The following example shows how to handle the Back key input with page navigation and application exit. This code is included in the TAU Basic project template app.js file by default.